A virtual platform or virtual prototype is a model of a hardware platform that runs on a simulator and provides the same behavior as the hardware platform – with the embedded software running. This site provides information on a comprehensive library of extremely fast and efficient virtual platforms and virtual prototypes of embedded systems. The platforms include CPU models of advanced processor cores and can run production embedded software binaries without modification. The whole focus of these models is to enable you to develop embedded software in a more efficient way, with less bugs, and in less time. The library of platforms listed on this site is built using the largest CPU model library available. Each platform model includes full documentation and details of the component models it uses. 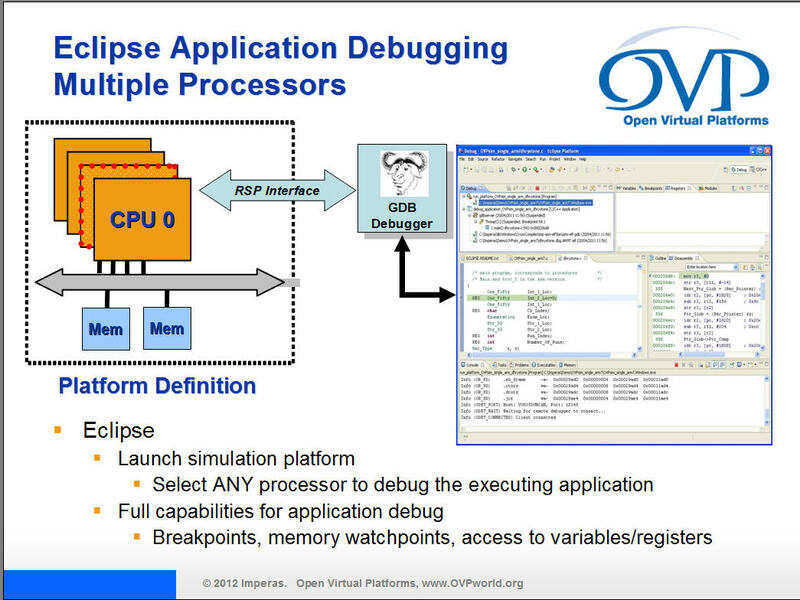 A key component is the Imperas OVP Fast Processor Models. More information is available on these models here. If you need maximum available simulation speed from the Virtual Platforms and Virtual Prototypes, then you need to find our more about QuantumLeap from Imperas. This uses the parallel resources of the host PC to accelerate your simulations. To explore how easy it is to use these Virtual Platform and Virtual Prototype models, look at the OVP starting page. Thank you for your interest. To contact us please visit Imperas or OVP.